This season will be the first that the Baltimore Ravens will start the year without place kicker Matt Stover. Stover has been a reliable fixture for the franchise for its entire existence. He's known for his reliable medium-range accuracy, but his field goal range and, possibly more importantly, his kickoff distance dwindled in recent years. Last year's kickoff specialist Steven Hauschka will now take over as the full-time field goal kicker. Keeping a kickoff specialist on the roster has become somewhat fashionable in the NFL, but I'm not sure when the trend started or exactly how many teams do it. It's an expensive thing to do, not just in terms of salary, but in terms of a roster spot too. If you've read John Feinstein's Next Man Up, you know how precious every spot is for the coaches, and how difficult the weekly decisions are about who to dress for each game. A kick-off specialist is a costly luxury. But maybe we're thinking about this backwards. Maybe we should ask whether it's worth it to have a field goal specialist. It's been shown here and elsewhere that FG kickers are very hard to tell apart from one another. I have no doubt that it takes great skill and countless hours of dedication be as good as NFL kickers are. However, almost all kickers at the professional level can be considered statistically as accurate as any other. Typically, NFL FG kickers have between 30 and 40 attempts in a season. Think of baseball batters' averages after only 40 at bats, which would be about 8-10 games into the season. By this point some replacement-level guys are batting .500, and some future Hall of Fame sluggers are batting .100. But absolutely no one thinks the batters are truly .500 or .100 hitters. It's just a matter of a small statistical sample, which makes it impossible to really assess individual batting skill. And if batting had a wrinkle similar to FG attempt distance, it would be even harder to assess skill. To me, it's absolutely laughable that some teams' kicker jobs are decided by pre-season contests based on maybe 4 or 5 attempts per kicker. I can only hope that coaches are really making these decisions based on many more attempts in practice. The point is that we need dozens and dozens of attempts, from various distances and in various conditions, just to begin to be able to tell one FG kicker apart from another. And I bet that if we actually could tell good kickers from lesser ones, a very large part of the difference would be due to range. So if range is important to both kinds of kicks, wouldn't a team prefer the guy with the deeper kickoffs? Plus, range is something we can actually measure. I can't definitively prove my point of view in a single post, but I can begin to look at some aspects of the value of deep kickoffs. In this post, I'll look at the value of something I think is often overlooked: the touchback. About 10% of all NFL kickoffs (not including onside kicks) are touchbacks. Forcing the opponent to start at their own 20 doesn't exactly seem like a death blow, but it is modestly valuable. The average starting position following all kickoffs (including penalties on the play) is the 30 yd line. But the average starting position for all non-touchback kickoffs is the 32. The difference between a touchback an non-touchback is 12 yds. If the 32 seems a little far down the field to you (like it does to me), it's because the median starting field position for non-touchbacks is the 27 yd line. 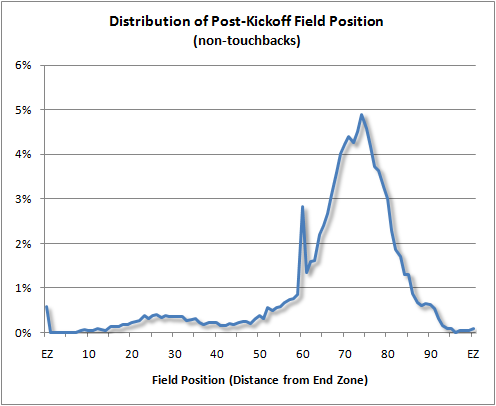 Here is the distribution of starting field position for non-touchback kicks. Sacks are worth 1.7 EP, so a touchback could be considered the equivalent of about half a sack. An alternative way of thinking of those 12 yards is to think of them as one additional first down required for a team to score. It's one more first down the offense will need to either score a TD or get into FG range. The average first down conversion rate in the NFL is 67%, so a touchback turns a TD drive into a FG drive or a FG drive into a punt 33% of the time. We can also use the concept of win probability to asses the value of a touchback. Over the past 9 seasons, non-touchback kicks average a change of 0.002 in WP. Touchback kicks average an increase of 0.01 WP. The net value of a touchback is therefore an increase in 0.008 WP, or about 1%. One percent isn't much at all, but with about 5 kickoffs per game for each team, the effect can add up. The WP added (WPA) of any given kickoff depends on the leverage of its particular game situation. With the game close and time dwindling, a touchback or deep kick can make a 2-minute offense that much harder for the offense. The biggest two touchbacks in my database (going back to 2000) were each for 0.13 WPA. Kicker Steve Lindsay, who played only two seasons in the NFL, was picked up by Denver from Jacksonville halfway through the 2000 season. With the Broncos Trailing 37-31 to the Chargers and 4:05 left in the 4th quarter, Lindsay boomed the touchback heard 'round the world (not exactly--but it should have been.) Field position in this situation was critical. A FG by San Diego would have clinched the game, and Denver needed the ball back in as good field position as possible. As fate would have it, the Broncos went on to win the game 38-37. Arizona kicker Neil Rackers owns the other touchback of the decade. In a 2007 game against Seattle, tied 20-20 with 4:53 remaining in the 4th, Rackers' touchback made it that much more difficult for the Seahawks to put together a game-winning drive, and would have made Arizona's own drive that much easier. What actually happened was that Seattle fumbled on a 1st and 5 from the Arizona 36, allowing the Cards to put together a FG drive to win the game. Sure, the game turned on a turnover and not field position, but had Seattle found itself on the Arizona 24 and not the 36, maybe the play call would have been a little safer. We'll never know. Anyway, those are my two nominations for the touchback hall of fame. It's not the most glamorous play in football, but it's certainly overlooked and worthy of examination. So what's the conclusion? Is the FG specialist worth the roster spot over the 9th o-lineman, the 6th receiver, the 7th DB, or the 3rd QB? Of course this is the part of the paper where the verb changes from "shows" to "indicates," but I bet you have enough data to make a case. I think his point is that there isn't enough value to keep two Kickers. The point he was driving was that a deep kick-off (read touchback) is can be worth more then a kicker with long range. Up about 35 yards most kickers a very similar. So for those kicks that are over 35 yards are you better off with a kicker that can regularly kick those in or a kicker that can kick a touch back. In the end I am not sure you even have to have the numbers on hand. Its a game of inches and if you can have a 7-12 yard advantage on kick-off in field position then most kicks currently kicked would be closer anyways (assuming same plays are called). Will, it would be hard to make any definite conclusion based on this analysis. Because every team has different needs, it would be impossible to answer 'yes' or 'no' to your question. For a team with a lot of depth, maybe it would be beneficial. On the other hand, it may be more beneficial to keep that rookie RB with hopes of them blossoming in future years, or that veteran LB who will provide leadership to your young LBs. But in reality, I can't name one team with good depth at every position. So the decision becomes (as most decisions) a balancing act for the head coach. Game theory, anyone? You'd think the most valuable touchbacks in terms of win probability would be when leverage is highest, i.e. late in a close game. Wouldn't overtime touchbacks have the highest WP value? There were at least four of them last season alone. And I'd bet you could also find a few later in the 4th quarter of a close game than four minutes remaining. Given that overtime coin toss winners win the game about 60% of the time and that the 20-yard line is still slightly better than break-even for the receiving team (according to expected points), I don't think it makes sense for a touchback ever to have more than a 10% swing in WP. A 13% swing for 12 yards with that much time remaining seems way too high. I suspect something isn't quite working right with your late game model. Why is it so hard to find help on how to read the win probability graphs? You'd think something like that would be easy to find. What does "LI" stand for in the box that pops up when you hover over the line? LI stands for leverage index. It's still under development as I haven't settled on a final methodology for it. Jim-That could be, but keep in mind what I wrote about it being "an extra first down required." If you can imagine a game where a team has to drive the field to win the game--down by 1, or 6, or whatever, with a couple minutes left. First downs are converted on average 67% of the time. If a touchback makes the receiving team get 6 consecutive first downs instead of 5, or 5 instead of 4, that means the touchback reduces the receiving team's chances of winning by a third. Admittedly, this is a rough way of thinking of it, but depending on the particular situation this would imply the receiving team would otherwise have a 39% chance of winning. I think that's very plausible. 0.8 EP per TB, 5 kickoffs per game. So, a guy who can boom every kickoff for a touchback is worth 4 pts over a guy who can't make touchback, assuming similar FG kicking ability. Assuming that a team can measure a FG kickers true probability curve in practice, it is theoretically possible to provide a pts value to each kicker. Just to carry on with should a team take a 3rd QB or a KO specialist, it depends on how likely it is that a team needs a 3rd QB to play. As above, a KO specialist is worth 4 pts. The average NFL offense scores 21 pts, but if we assume that a team forced to play without a specialist QB (for instance, through injury) scores no points, then the BEST CASE value of a third QB is 21pts x p(first two QBs being injured) - the 3rd QB is worth nothing if he doesn't get on the field. This is a best case as it assumes the 3rd QB adds 21pts over a non-QB once he gets on the field, both unlikely as he would probably not get on early enough nor is he as good as the previous two QBs. Thus, a 3rd QB on the roster should be picked above a KO specialist if the probability of the first two QBs getting injured in the game is 19% or greater. In this case, the QB adds more points on average than the KO specialist. Does your play-by-play database tell you if a punt went out of bounds? I'd think that there would be a noticable advantage to punting out of bounds or at least towards the sideline. I know that punt returns aren't as long as kick-off returns but a kick out of bounds would remove any possibility of a long return. As I see it there are several problems with the coffin-corner kick. One being that because you are kicking on an angle it has to travel farther to get the same punt length (think hypotenuse of a right triangle with the short side being 26.67 yards). So if the punter kicked it 46 yards to the sideline it would only travel 37 yards downfield. Is that worth more than the average punt return? On upside of it is that it would be harder for the punt returner to catch and make a good run out of even if it stayed in bounds. They would have to sprint to the sideline and then change direction to turn upfield. Also they would have less field to work with because the sideline takes away most of the angles. The kicking team (which would know which side the punter was going to kick to in advance) should have a sizable advantage on kick coverage. Ben, you also have to consider the possibility that the punt goes too wide and only goes a comparatively short distance before going out of bounds - effectively a decent punt return. Anyway, back to the purpose of this post, that's great to know! A few years ago the Cowboys were debating needing a KO specialist because Grammatica couldn't get punts beyond the 10 yard line, making for even easier returns. Good to know there is actually some reasoning behind them getting a KO specialist this year in the draft! Just to be clear, this is only a very small part of the answer. A kicker is never going to kick all 4 or 5 kicks in a game for touchbacks. But, this analysis at least gives us an idea of how valuable a deep kicker can be. For non-touchbacks, a kicker benefits by nearly exactly 1 net yard for every 2 yards of additional depth. This is because the returner will have more time to run up-field before encountering the coverage. 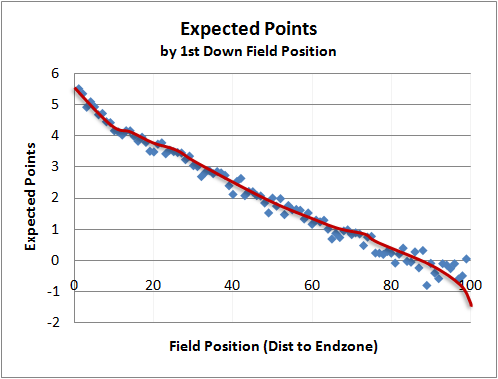 At the 40-20 yd line region, every yard of fld position is worth 0.06 expected points. So for every additional yard of kicking depth, you'd expect half that--an extra 0.03 EP. The standard deviation of kicking depth is just over 2 yds. So the difference between a typical above average kicker (at +1 SD) and a below average kicker (-1 SD) is about 5 yds. This is equivalent to 0.15 WP per (non-touchback) kick. With 5 kicks per game, you'd net 0.75 EP. Great post. Keep up the superb research. its nice to see a sharp mind with a disciplined approach figuring out what the value of this stuff is. My perception during games is that announcers don't give a hoot about a touch back or a return to the thirty, its all the same to them. And they certainly don't celebrate it like a sack! Just an FYI guys...the link in the paragraph describing the Arizona-Seattle game takes you to the Denver-SD match instead. (The link in that paragraph is correct.) Great post, as usual. What would the WPA have been last Monday if Buffalo's Leodis McKelvin had simply accepted the touchback by taking a knee in the end zone? What would have been the WPA had McKelvin returned the kick for 7 seconds (so as to deprive New England of the 2 minute warning, but not fumbled the ball? If Lindsay's touchback should have been the "touchback heard 'round the world," McKelvin's return is the "should have been a touchback hear 'round the worlds." It would be very interesting to see some numbers on what might have happened if McKelvin had made a different choice or if his choice had not had such a bad consequence. Thank you for considering this request. Love your work. All of this makes me wonder is it ever really worth taking a knee as the returner? Unless the guy's backpedaling as he receives, or is more than maybe six yards deep, it seems to me it'd be worth taking it out. Worst case scenario (I would think) is you end up on about the 15. No idea what the numbers show on this or where to start, I'm brand new to the site, but I gotta say so far this is great.